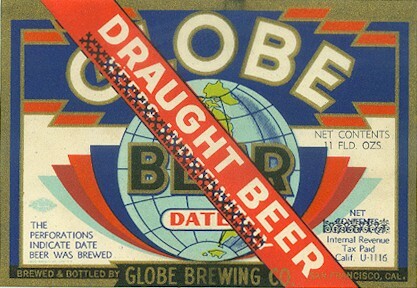 The Globe Brewing Co. of San Francisco was organized in May of 1933, a month after the repeal of national Prohibition. The company opened with $100,000 in paid-up capital, and began production in June of '33 under Calif. U-Permit No. 1116. The company's president was Walter Metzenbaum, with Ewald A. Iwen as secretary and general manager. Their brewmaster was Munich trained Oscar Lehman, who had spent twenty-five years with the Salt Lake City Brewing Co. The plant employed approximately 100 people and was equipped to produce 300 barrels per day. It was located in a industrial area at the foot of Telegraph Hill, in NE San Francisco, on a three lot parcel at 1401-1423 Sansome St. This was the prior home to the Acme Brewing Co. (1906-1920), and the California Bottling Association (1921-1929). With the advent of Prohibition in 1920, the Acme Brewing Co. (by then dba the California Brewing Association) was reorganized as the Cereal Products Refining Corporation. The Sansome plant was soon established as a division of Cereal Products, and became the Acme Bottling Co. (dba the California Bottling Association). In 1929, the Merchants Ice & Cold Storage Co. acquired 20% of Cereal Products, and control of the Sansome plant. Four years later, Merchants leased the plant to Globe, as well as considerable refrigeration space for their cellaring. When planning the new brewery the principals relied heavily on their general manager, Iwen, and his engineering background. They adopted his recommendation for a new, high tech brewing process by Sietz - a refrigerated bottling line which precluded the necessity of pasteurization. 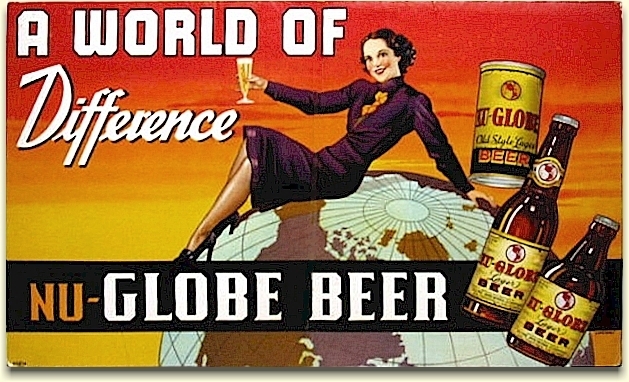 The brewery's flagship brand was Globe Beer (ad at left), but they also added an ale to their product line called DeLuxe Ale - as well as a seasonal, Globe Bock Beer. To maximize their capacity, and income, they did extensive contract brewing. Initially they brewed and bottled World Liberty Beer for the Liberty Bottling Co. 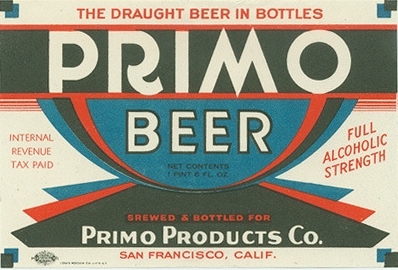 They then contracted to produce Log Cabin Beer for the Log Cabin Sales Co., and Primo Beer for the Primo Products Co. They also bottled Excell for the Pacific States Bottling Co., and later, King's Taste for Hagstrom's Food Stores. All of this contract brewing was for distributors who sold primarily to grocers. However, this strategy may have been counter-productive in that it stigmatized Globe as a brewer of cheap, off-brand beers - thus preventing them from obtaining premium beer prices for their products. Of course they didn't bottle all of their output, but also relied on the sale of keg beer to taverns. But here again, they adopted a more high tech, and costly concept. They purchased stainless steel, thermo barrels to help keep the beer cold in transit. An August '33 ad (right) shows the keg. 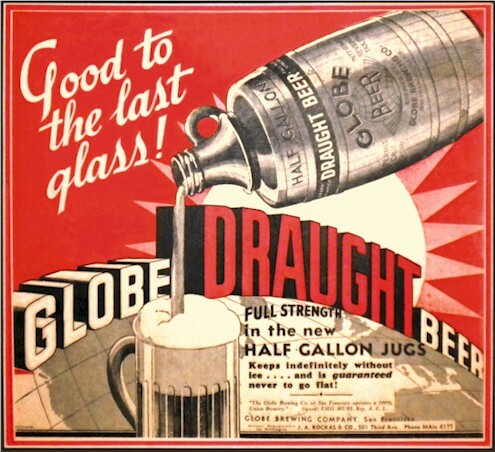 To capitalize on their European made Seitz bottling line, which is a sterile filtration system, the company introduced their Globe Draught Beer in Dec. 1934. The beer was packaged in a distinctive, half-gallon jug - now called growlers, and sold for fifty cents. This Sept. '35 article (below) ran in a brewing trade publication explaining the process. The use of these proprietary jugs added another extraordinary cost to the company. These were designed exclusively for Globe, and is the only known bottle displaying a Federal U-Permit number. 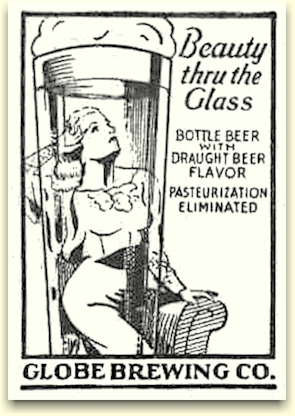 These half-gallon jugs were popular, but other brewers used an inexpensive, clear glass, labeled bottle which wouldn't have required a deposit nor incurred the additional costs of handling the returns. Profit margins were already slim with the contract brewing of grocery store beers, when a price war in the beer industry made matters even worse for the struggling enterprise. By December of 1935 the brewery owed in excess of $100,000 and had filed for bankruptcy protection. Another factor for their financial problems may have been the failure of the non-pasteurization bottling system. Whether it was the Sietz bottling line or the improper storage upon delivery to the retailer, the claim that the beer "keeps indefinitely" obviously wasn't true. The label shown (at right), with the claim crossed out, would suggest that un-happy customers, and returned stock, cost the company dearly. It's surprising that Globe proceeded with their unpasteurized beer roll out, given that the Acme Brewery had terminated this practice earlier that year. Perhaps they felt that their Seitz bottling line would give them the edge where others had failed. One of the brewery's principal creditors was the owner of the property, Merchants Ice & Cold Storage. 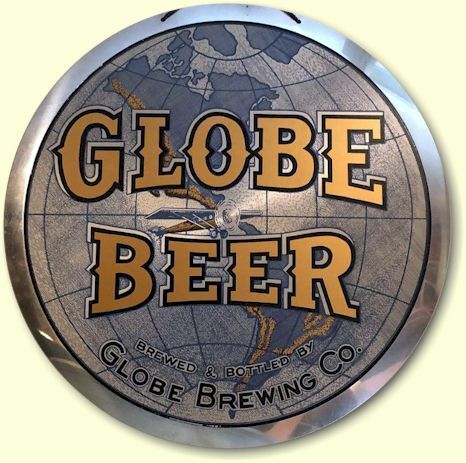 Since the brewery's assets still exceeded their liabilities, some of the principals in Merchants decided to form a group to reorganize Globe and rescue it from bankruptcy. 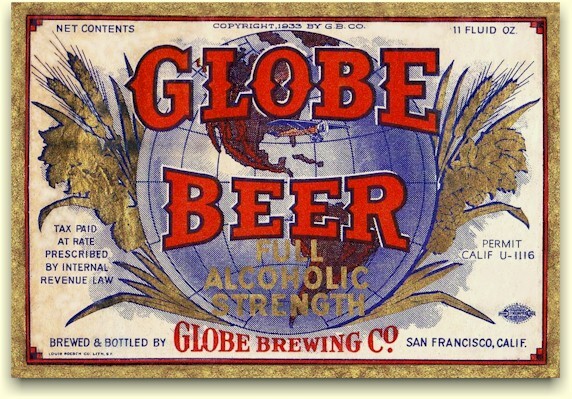 In May of 1936, the Globe Brewing Co. emerged from receivership and resumed operation. Michael Maffei was Globe's new president (and Merchants' v-p); with A. J. Scampini, counselor (as well as Merchants' counselor & 2nd v-p); W. A. Sherman, sec-treas. (and Merchants' pres. & general mgr. ); and J. S. Beriro, asst. secretary. Lodovico L. Sozzi became a company director and vice-president of Globe, and continued as such until Sept. '37 when he replaced Maffei as president. As a major move in saving the company, the new group adopted the newest trend sweeping the brewing industry - canned beer. They invested more capital installing a pasturizer and their own canning line. With this new capability they again turned to contract brewing to strengthen their bottom line. This photo shows the four brands canned by Globe. 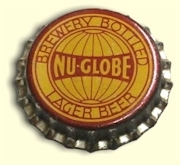 Only Nu-Globe was the company's brand. This may have been an attempt to tell the public that the old Globe Beer's problems had been solved. Fort Sutter was a new brand that was canned for the Bert McDowell Co., and as mentioned above, Log Cabin for the Log Cabin Sales Co. and the Primo brand for the Primo Products Co. All four of these cans are greatly sought after by today's collectors. With a new team in place the company tried to regain lost ground. 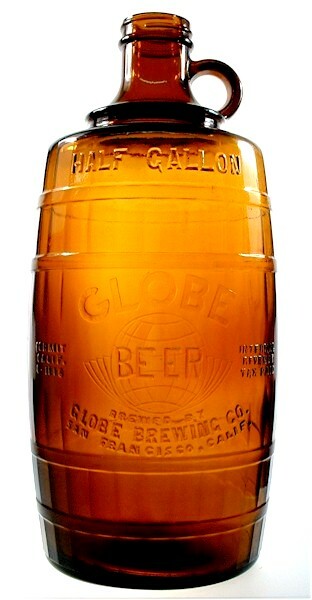 They continued brewing & bottling Globe, but without the "keeps indefinitely" claim, and now in plain, no-return jugs. They also kept Nu-Globe and Primo, plus they introduced Portola Lager as another of their bottled beers. Their canned beer line-up remained unchanged. However, in spite of their new products, new packaging, and new management the company failed to prosper. Once they had earned a reputation for bad beer, it became an insurmountable obstacle, and they could not handle the debt for the added capital expenses. 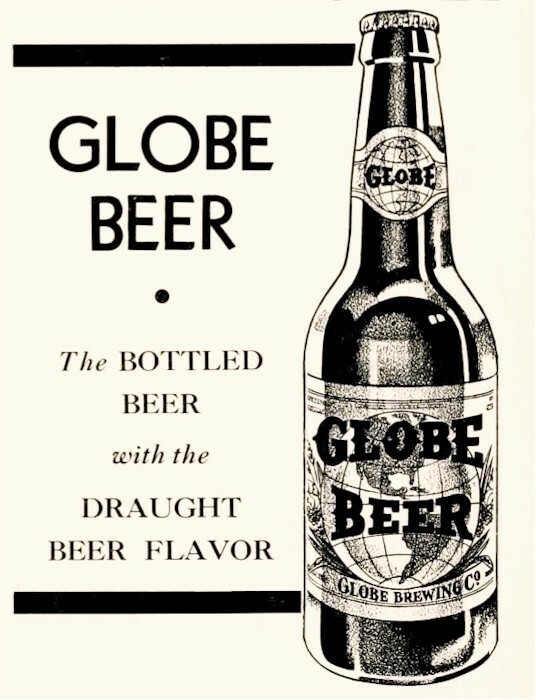 In August of 1938 the Globe Brewing Co. was again in receivership and this time would not survive. Given the mere five years of operation, there are not many collectibles from this brewery. 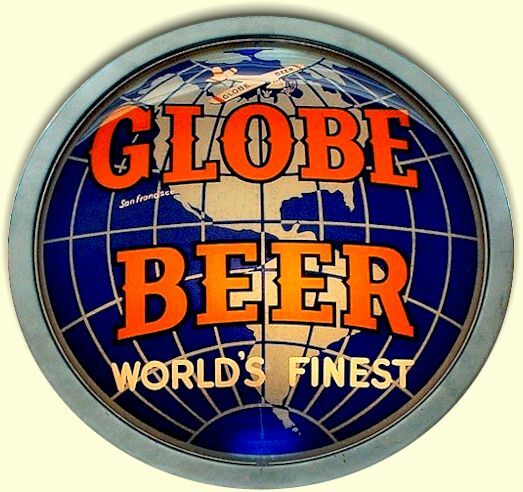 I have never seen a Globe beer glass, tray, or tap knob, but they may have had them. Even the labels are scarce! The figural bottle opener seems to be the most common item from Globe, and the embossed half-gallons were so unusual and decorative, that people kept them, and many have survived. 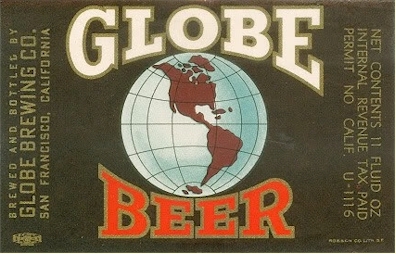 Here are a few examples of Globe breweriana. To Carl Scheurman for the Globe Beer newspaper ad. To Steve Freedman for the aluminum Globe Beer sign by Leyse. And to Rawley Douglas for the Nu-Globe Beer, cardboard sign. and can not be used without permission from BreweryGems.